Damascus (AFP) - Syria's government said Sunday it has turned over all its chemical weapons and adhered to an international treaty, after US accusations that it had carried out several chlorine gas attacks. "Syria has fulfilled its obligations by adhering to the Chemical Weapons Convention," the foreign ministry said in a statement published by state media. "It cooperated fully with the Organisation for the Prohibition of Chemical Weapons and no longer possesses these weapons," it added. The comments come after US Secretary of State John Kerry on Thursday accused Syria's President Bashar al-Assad of violating the convention by using chlorine as a weapon. "We believe there is evidence of Assad's use of chlorine, which when you use it -- despite it not being on the list -- it is prohibited under the Chemical Weapons Convention," Kerry told US lawmakers. The United States also had "some questions about a couple of other items" which were being investigated "so he's in violation of the convention," Kerry added. Syria was not required to declare any chlorine stockpiles, but the toxic agent can be considered a chemical weapon if used offensively, violating the Chemical Weapons Convention. 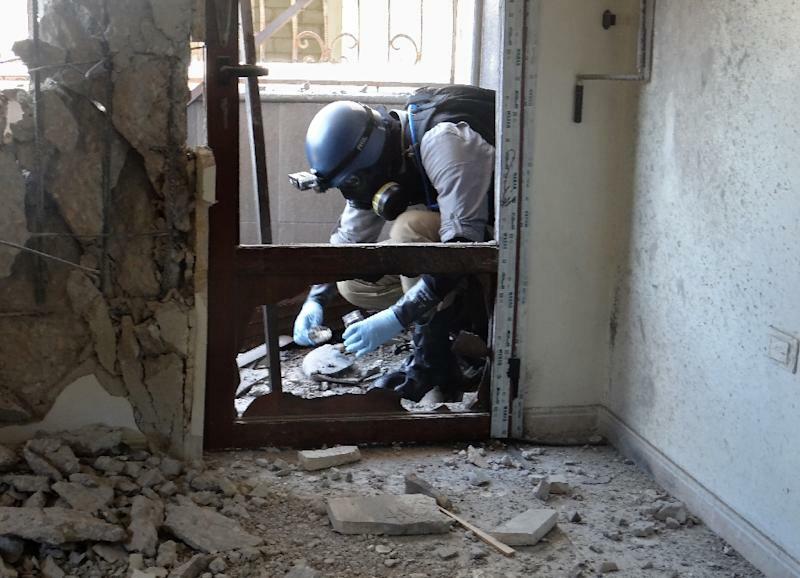 The OPCW has reported "compelling confirmation" that a toxic chemical was used "systematically and repeatedly" as a weapon in northern Syria earlier this year. It said it had a "high degree of confidence" that the chemical in question was chlorine. Syria's government has always denied responsibility for the August 2013 chemical weapons attack, accusing rebels of carrying it out to spur international intervention. And the foreign ministry warned Sunday of a similar "conspiracy." "Syria warns against the possibility of a conspiracy against Syria by regional and Western parties to provide terrorist groups with chemical weapons to be used against our people," it said. The objective of such a "conspiracy" would be "to accuse the Syrian army and launch an (international) attack against Syria." The United States threatened military action against Syria's regime after the 2013 sarin attack, but held off following the chemical disarmament agreement. Washington is now weighing air strikes inside Syria against the Islamic State jihadist group as part of a coalition effort. Syria has said any unilateral military action against jihadists on its territory would be a violation of its sovereignty. Britain's Prince William on Thursday met with some of the police officers and medics who were the first to respond to last month's mosque attacks in Christchurch, New Zealand. The Duke of Cambridge arrived in Christchurch in the afternoon after earlier attending an Anzac Day service in Auckland alongside Prime Minister Jacinda Ardern. William is on a two-day trip to New Zealand and plans to meet later with survivors of the mosque attacks in which 50 people were killed and 50 others wounded.